She’s all dressed up with nowhere to go. All the trim is painted Simply White and walls are Templeton Gray, both from Benjamin Moore. Carpet has been finalized and ordered, but we’re waiting on install. After that, we can put closet doors on, and get what little furniture we have back in here. Right now, the only piece of furniture we have is a mattress. Everything else still has to be built/found, but that hasn’t stopped the ideas swirling around in my brain. Some days I want a plush upholstered headboard. Others, I’m brainstorming up a beautiful leather creation. And then there are days I want nothing but a simple wooden headboard. This beauty has stolen my heart (as with many of the other items in the mid century Chairish collection), but it’s two sizes too small for our California King sized mattress. I’ve mimicked the wall, trim, and carpet colors before layering in some of my favorite elements. Neutrals mixed with a few bits of color, but nothing overwhelming. Above the bed, I’d love to frame a turkey tail my father-in-law gave me. If the final headboard is neutral, I’d love to add in some more color with painted night stands or dressers flanking the bed. These green beauties by The Painted Hive are so fantastic. ;lkuefrlkaseliuth Oops, that was me, wiping the drool off my keyboard. Lamps are still up in the air until I find a pair I love. Sconces are also an option, depending on the size of the night stands I can muster up. Have you noticed the trend? Everything is in flux, each item depending on another to know which way to take the design. Over the years, I’ve realized I absolutely loathe making king beds with solid colored sheets. Since the dimensions are so close, it always seems like I get the wrong side on and have to start over again. Striped sheets not only look pretty, but the directional pattern is helpful when making a nearly square bed. 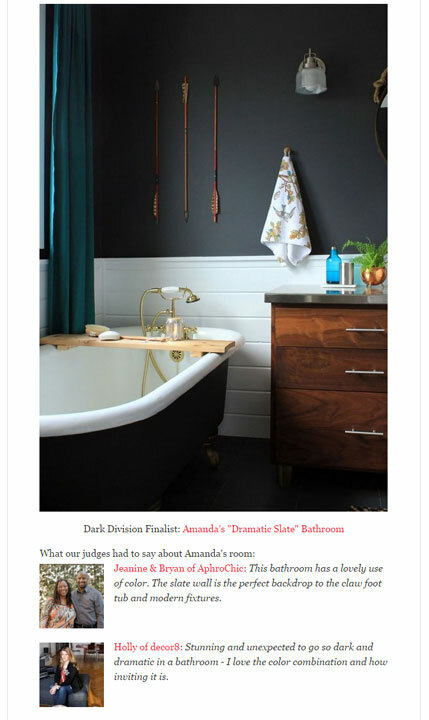 When I selected the wall color, I knew I wanted something that wasn’t a neutral, but would easily pair and complement my favorite colors: blues, greens, and mustards. 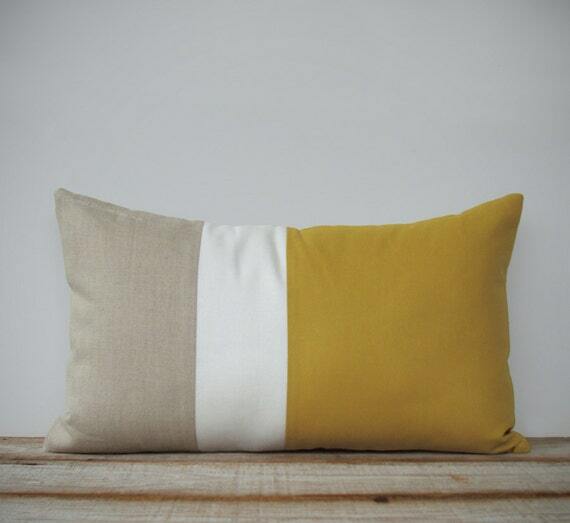 A beautiful, but simple color blocked lumbar pillow in a neutral and mustard colorway is just enough color. For a bit more green, I’d love to hang a pair of beautiful prints by the ever so lovely Living Pattern shop. I especially like the Pine and Maidenhair ferns. Depending on how the space feels, I may or may not add a bench at the foot of the bed. If that happens, I’d love a natural linen tufted beauty. At this point, I haven’t had much luck finding pieces I absolutely love. A test of my patience is probably going to happen, and I’m always impatiently waiting. Can’t wait to see the final reveal. This has been a fun project to follow (aka watch from afar without having to do any of the work!). Of course I was going to add green to the mix. 😉 Ha, I’m happy you’re enjoying it. I’m really excited now that it’s coming down to the pretty/fun parts. I know he is probably busy, but it seems like your husband could build end tables like the ones you want; and maybe some of the other pieces as well. Would he be willing? You’re completely right. I’m sure Ben would be able to build pieces, but it’s a matter of time and what is a priority. Right now, we’re focusing on getting the laundry and bathroom finished. Laundry needs cabinets, while the bathroom needs everything except floor tile, so it might be a while. 🙂 We also have a big project that is still in the planning stages that has become the next priority after the basement, so I doubt furniture is high on the list for a while. Boo, but that’s okay. I can make due with some things that I have that aren’t perfect until I find or build what we need. I am not a fan of blue, but I always like the green you add to a space. I am a green and mustard fan so two out of three is pretty good. Did you say where the pillow is from? Nice prints. This is the fun part of a project, the finishing touches.